An action research exploratory study with sixth grade students at Mills Lawn grew out of Project Peace: Confronting Bullying through Art, which took place in the spring of 2013 and was a successful school-wide arts initiative that used art education to engage students in issues of social inclusion and bullying behavior. 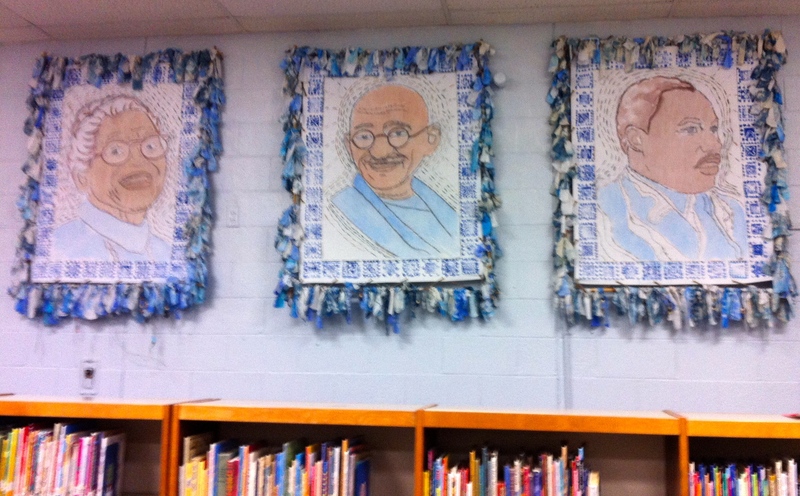 The resulting Hero Peacemaker Triptych is hanging in the library at Mills Lawn. As part of the first phase of Project Peace students were empowered to be role models, upstanders rather than bystanders, and peacemakers in the school and wider community. An extension of Phase I the Action Research Project in the Fall of 2013, led by graduate student and researcher Allison Paul with the support of school counselor John Gudgel, engaged students in exploration of the central question, “What challenges are you facing as students at Mills Lawn?”. Dialogue, Role-Play, and Mapping were some of the strategies used to engage students in this critical question aimed at motivating students to embrace their own capacity to be change makers and take action to create peaceful solutions to the everyday challenges in their lives. In addition to grade level group research, a group of sixth grade students continued their dedication to serving as role models by creating a Peacemakers focus group. These students shared a skit titled, “Power Peacemakers” at an all school meeting before winter break that modeled inclusion in the context of socializing and sitting together in the lunch room. Take a look! Additionally, below are more resources outlining our experience as researchers during the action research project. The discoveries and energy generated by students during the research motivated the next stage of Project Peace funded by the Yellow Springs Community Foundation. 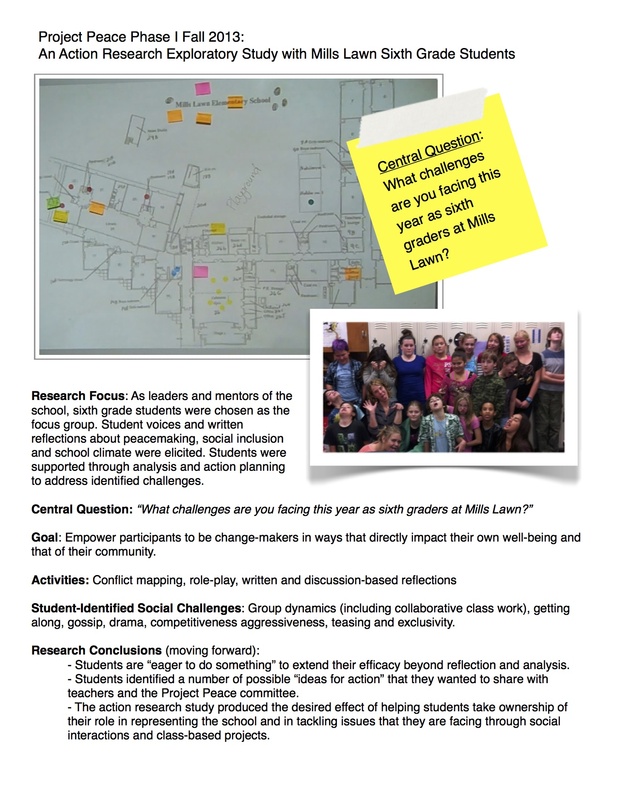 Follow the progress of Project Peace 2.0: “What does peace look like at Mills Lawn?” in Spring 2014 on this blog!